One of the leading reggae bands in the United States has sold out an impressive string of concert dates. 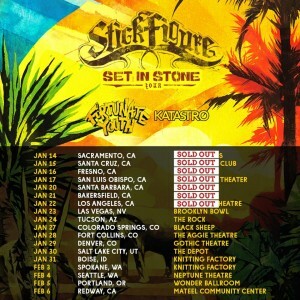 The California based roots-rock-reggae band, Stick Figure, has kicked off their winter Set In Stone Tour with a stunning number of sold out shows. The number of sold out shows gives respectability and prestige to the ever-growing American reggae movement. Stick Figure began their Set In Stone Tour in the “Golden State” of California, their home turf. To start things off, Stick Figure opened their winter tour at the Ace of Spades venue in Sacramento, the state’s capital. Before a week passed on their first leg of the tour, Stick Figure sold out consecutive shows in Santa Cruz, Fresno, San Louis Obispo, Santa Barbara, Bakersfield and Los Angeles. The majority of the venues on this tour hold a capacity of 1,000 ticket holders. Other venues are 750+ capacity, still a large number of fans for some auxiliary or secondary markets. Many of the shows on this tour, Stick Figure arrived to the venue knowing that tickets were no longer available at the will call window. To date, Stick Figure has sold out seven-consecutive concerts on the Set In Stone Tour. It should be noted, the opening acts for the winter tour include reggae heavyweight, Fortunate Youth, and alternative rock band, Katastro. There are 11-dates remaining on the Set In Stone Tour, including shows in Arizona, Colorado, Utah, Idaho, Washington, Oregon, before concluding the month long tour in Redway, CA at the Mateel Community Center (the home of Reggae on the River). For more information on Stick Figure and all upcoming tour dates, follow the links below.